Towering spikes of star-shaped, white or pink flowers on large panicles up to 60cm long in midsummer. This striking, clump-forming perennial with its horse chestnut-like leaves looks great planted in the moist margins of a stream or pond. 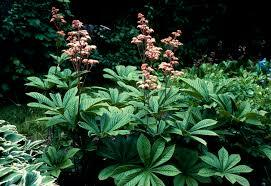 Best grown in a sheltered, shady spot where it contrasts well with the lacy texture of ferns. Categories: Autumn, Featured Plants, Plants A-Z, Plants by Season, Plants In Situ, R-T, Spring, Summer, The Woodland Walk.